The rich and influential, in an attempt to show their understanding of the resentment of the common French people, began to encourage furniture that was more sober. Instead of swirling curly cues that reached higher and higher amid 25-foot ceilings, Louis XVI furniture emphasizes symmetry, and a return to classical decorative motifs. 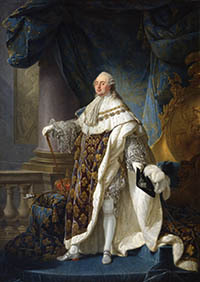 Owing to the popularity of executing the rich who flaunted their wealth, the emergence of the Louis XVI style started before the king's reign, which began in 1774. By the end of the reign of Louis XVI the curve was rejected. This offers the biggest visual clue that a piece is Louis XVI: most structural lines are straight. If a curve is used instead of the flowing S curve, Louis XVI incorporates the succinct serpentine curve. Louis XVI used the natural grain of the woods to create pattern and design on casegoods. It was almost as if the ruling class were saying to the starving Parisians, "Look, I can be natural and humble just like you." And it was much like the peasant hat worn by Louis XVI in a portrait that tried to express the same sentiment. He was guillotined in 1793 despite this effort. However, expensive materials were still the rule, and very skilled artisans whom only the wealthy could employ made the furniture as they had in Louis XV reign. Pictorial designs were favored over the loose unsymmetrical arrangement of floral decorations. Marquetry pictorials depicted landscapes or architectural themes. Porcelain plaques become popular in this era as a uniquely French design material. Chairs, which had grown round and inviting looking--perhaps to be sat on by a party of cake eaters--changed to rectilinear in shape. Since the average citizen's living condition tended toward the squalid, they became resentful of titled aristocrats that lived in palaces Taking the hint, the rich started to move into more modest digs, and as a result the furniture scale became smaller. This era is also known as Neoclassical as furniture returned to themes and dimensions of Greek and Roman times. Neoclassicism arrived at a time when Pompeii was discovered and excavated, and France's ruling class aspires to connect to a long-reigning and influential world power. Hardware grew less elaborate but of a higher quality as conspicuous ornamentation became something that might elicit a visit with the guillotine. Powerful ideas that would create the American and French Revolutions were changing the ideas of absolute rule and a king's powers. Just before the American War for Independence was when the decline of the extravagant Louis XV style began. This change to a less frivolous style was a precursor to the American War of Independence and reflected a dramatic shifting of powers. In France, the common people felt the rich had not sacrificed enough by sitting in less opulent furniture, thus bringing on the French Revolution and ending the Louis XVI style by 1792.